Right now, more than 13 million Americans are unemployed, and our country is in desperate need of job creation and economic development. If President Obama is serious about putting Americans back to work, he would look no further than our domestic energy sector. As Houston has proven, advancements in American energy production can create jobs and decrease our dependence on foreign nations for energy resources. Private sector energy companies want to put Americans to work, but economists and analysts alike have blamed uncertainty as one of the biggest hindrances to our recovery. Since February 2009, the Obama Administration has systematically derailed the energy industry by delaying or cancelling many proposed energy projects, and cancelled 77 energy land leases in Utah, citing the need for additional review. According to the American Petroleum Institute, these leases had already completed all necessary requirements. Furthermore, the Government Accountability Office noted the administration has failed to issue 91 percent of leases on federal land in a timely manner. These are jobs being left on the table. Another reason for private sector uncertainty is the threat of onerous regulations that will cripple the energy industry. Take, for instance, the Eagle Ford Shale development in South Texas. A small town job fair recently held in Beeville attracted more than 2,000 employment-hungry Americans to fill more than 1,000 jobs being offered by the oil and gas industry. President Obama’s call for new, burdensome regulations will delay the hiring of these professionals, and put those already hired at risk of being furloughed, or worse, let go outright. The administration seems to think these regulations will only affect the top-line profit for energy companies. They do not take into account the total amount of jobs that are generated by this industry. Every worker, from drivers to equipment manufacturers, risks losing employment once these restrictions create an eventual slowdown in production. This is not the way to generate an economic recovery. Recently, debate in Washington has focused on the construction of the Keystone XL Pipeline to increase the flow of Canadian crude oil to Texas refineries. 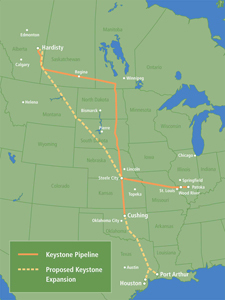 This pipeline would be incredibly beneficial to both our nation and Texas. In addition to bringing 50,000 jobs to our state, it would create 120,000 jobs nationwide, and drive $2 billion into the Texas economy. Most important, this project will be built without using a single cent of taxpayer dollars. The U.S. State Department has also concluded this would be one of the safest pipelines ever assembled under current statutes, but as the Environmental Protection Agency speaks out against the project’s approval, more and more American jobs are lost every day. The facts can no longer be ignored. We should allow private industry to invest their own money to create jobs without the federal government watching its every move. Mr. President, approve the Keystone XL Pipeline now, and stop destroying the domestic energy industry through over-regulation. Let’s get Americans back to work.